see portions of the mural. 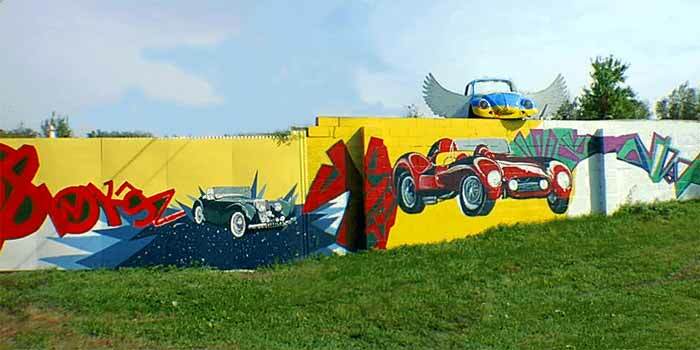 100 feet of fence plus a beetle sliced in half, nudged the mural into reality. 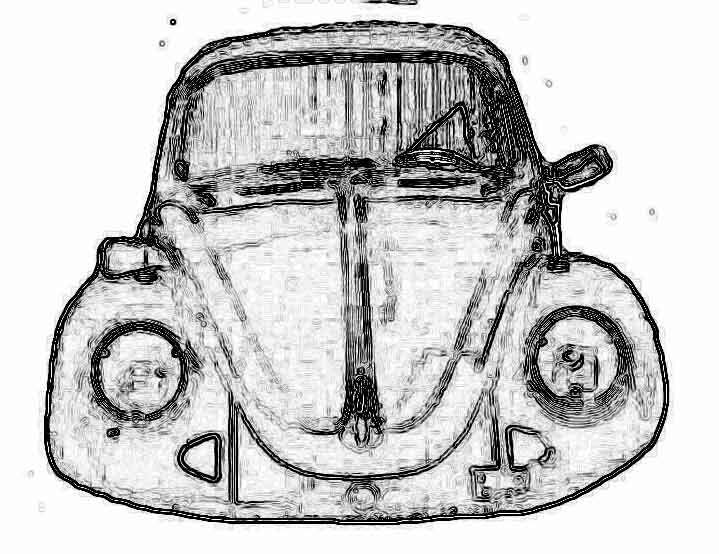 We took a digital photo of the cut in half beetle, de-saturated the color and turned it into a coloring book line drawing. We duplicated it 300 times and passed it out randomly and to Joyce Kilmer School in Milltown, Hamorjold in East Brunswick and McKinley School in New Brunswick, (all in NJ. ) Color the VW we said! We received 257 responses. Two years after the project began, we got an envelope in the mail Postmarked "Indonesia". 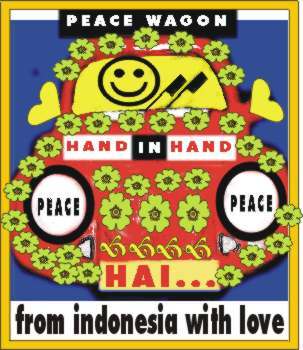 Inside was a colored Volkswagen by an artist in Indonesia we came to know as "Samuel". Click here and you can see some of the VWs which rolled in to the Cyber Gallery. Random people of all ages sent colorings for the Volkswagen. They were told that one design would be selected to be reproduced on the real half a beetle. A selection was made and the design was reproduced on the car. 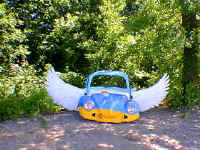 Chris MacKinnon, Shark River, NJ, created the "Wings" for the beetle and the Beetle was hoisted into position where it sat on top of the fence as seen in the picture.. For six months after the beetle was completed it sat on top of the mural on Harts Lane. After that, the flying beetle went to the Cork gallery, downstairs from Avery Fisher Hall, Lincoln Center as part of the show "The Hub-With Magnetic Connections". riding around on the fire engine red Val Van for next few years. Surprising children at traffic lights! The ride by art show! We spent months collecting discarded refrigerator doors of all kinds so we would have a place to display all the Volkswagon designs. We took the doors to the Cork Gallery, Lincoln Center along with the hubcap show and also to the Quietude Sculpture Garden in East Brunswick, NJ. About the artists: "Little Bobby" Duncan, (Jamesburg, NJ) did the red car and the green car. Duncan has painted his way across the country on denim jackets, hats, sneakers, walls, giant 60 foot Koala bears, you name it, if it stands still long enough, Duncan will paint it. Look for him in Artists A-Z. Judy Wray created the overall design and orchestrated the idea, pulling artists and students together for the summer. Dewight Braithwaite(12), Justin Price(7), and Richard Campbell(12), showed up every day for a week painting in the background. Chris MacKinnon created the wings!